The first wave of what might be called Trump assassination chic, soon after his election (remember Kathy Griffin holding his severed head? ), led to widespread condemnation and some actual career consequences. Griffin was properly condemned, even by Chelsea Clinton, who called it "vile," in fact; apologized; and began to revive her career. But perhaps out of frustration over the failure of the Russia hoax to work, the Hollywood left is back at it, this time more subtly, perhaps subliminally. Alana Mastrangelo covers the issue at Breitbart. 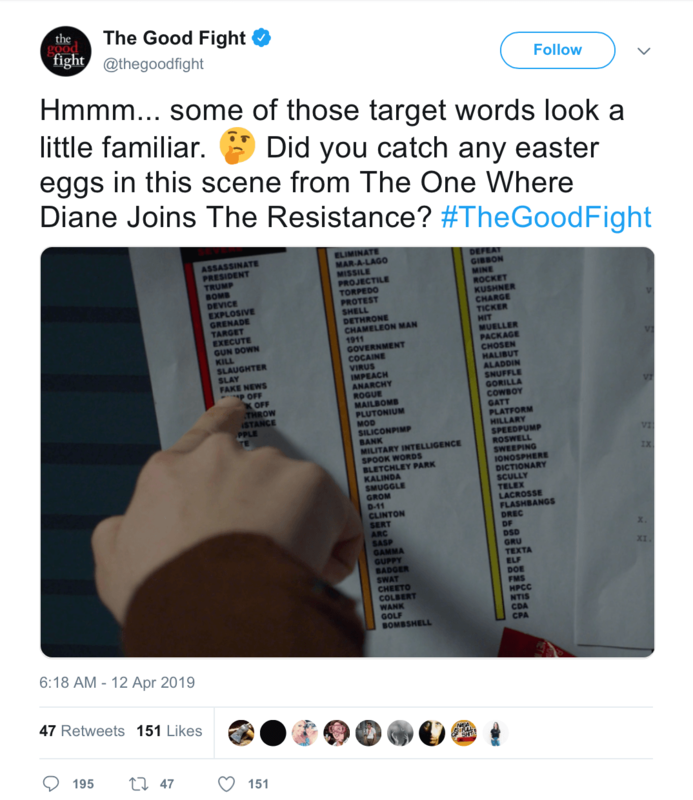 CBS crime drama The Good Fight tweeted an image on Friday from a recent episode, entitled The One Where Diane Joins the Resistance. The image shows a character pointing to a list of "target words" that includes the phrases "Assassinate President Trump" and "Eliminate Mar-a-Lago." The tweet, which has since been deleted, sparked backlash among Twitter-users, many of whom reported CBS to the Secret Service. Chelsea Clinton is smart enough to realize that justifying assassination of politicians you hate is a two-edged sword, one that will be used against you once that sword is unsheathed. But this level of thought is beyond the producers of this show. CBS ought to cancel the show for this appalling tweet. If Roseanne Barr's career can be ended by one tweet, so should a far less popular show bite the dust over an outrageous incitement to assassination. The Secret Service probe will come to nothing, but there should be consequences. The Left is pushing us toward dystopia.